Dr. Martin is a Utah native. He earned his bachelor’s degree at Weber State University, followed by his Medical degree which was earned at the University of Utah School of Medicine. Dr. Martin served his residency in Obstetrics & Gynecology at St. Louis University in St. Louis, Missouri, where he served as Academic Chief Resident. He received the Senior Resident Research Award, Saint Louis University Department of Obstetrics & Gynecology, and Women’s Health Resident Research Symposium. Dr. Martin is a member of the American Association of Gynecologic Laparoscopists, and the American Congress of Obstetricians and Gynecologist, Junior Fellow. 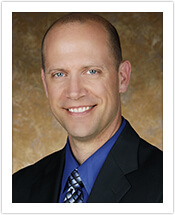 In his leisure time, Dr. Martin enjoys spending time with his wife and four children. He also enjoys hiking, fishing, hunting, camping, basketball, home improvements and working on classic cars.